STOBER Selected as Tour Site for Association for Manufacturing Excellence 2015 International Conference – STOBER Drives Inc. The AME 2015 International Conference was held October 19-23 in Cincinnati, Ohio. It is the largest lean conference in the world. The goal of the conference was to provide attendees with a transformational learning experience on lean processes, leadership, and productivity. Attendees were given the opportunity to visit local AME members and learn about their lean processes and improvements they have made. Numerous organizations were used as tour sites, including MillerCoors, Kroger, JBM Envelope, Bosch, Toyota, Sur-Seal, and STOBER. STOBER has been a member of the Association for Manufacturing Excellence (AME) since 2010. The company has focused on lean events and trainings, participating in at least one event per quarter. 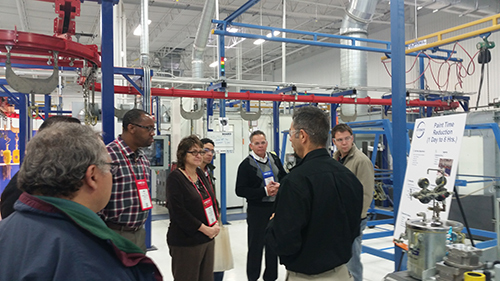 Approximately 50 people from across the United States and the world visited STOBER. Visitors came from Texas, Michigan, California, New York, Canada, Mexico, the Netherlands, the United Kingdom, and the Middle East, to name a few. An introduction to STOBER was given by Peter Feil, General Manager. He shared the company’s focus of reliable, quality products and emphasis on people development. STOBER gearboxes are built and shipped in one day out of Maysville, allowing customers to utilize lower inventory levels since the product can be delivered quickly. STOBER gearboxes are also highly efficient and durable, resulting in lower energy costs, no maintenance cost, and no downtime. These advantages fit into the lean philosophy supported by AME. Khrysten Childers, talent development leader, presented the company’s STOBERU program, an online training program. It allows training to be automated and consistent. Every new hire can take employee orientation and department modules online. After the introduction, visitors were given a tour of six areas in the STOBER facility, led by Nathan Landreth, manufacturing engineer, Alex Flores, industrial engineer, and David Dunnavan, industrial engineer. Visiting groups were told about improvements made in receiving by Earl Bennington, production by Jamie Collins, assembly by Wayne Dugan, paint by Javier Cardenas, customer service by Marra Ruark, and manufacturing by Landon Garrison through lean events. Some of the enhancements made by STOBER included going from a 3 day build to 1 day, adding conveyors to reduce the amount of parts handling, decreasing paint time from 1 day to 6 hours, reducing manufacturing setup time, and going paperless in customer service. When asked what they have learned from STOBER that they could implement at their facilities, visitors responded with apprenticeship program, online learning abilities, excellent culture and employee motivation, clean facility, two way communication, and flexible paint covers.